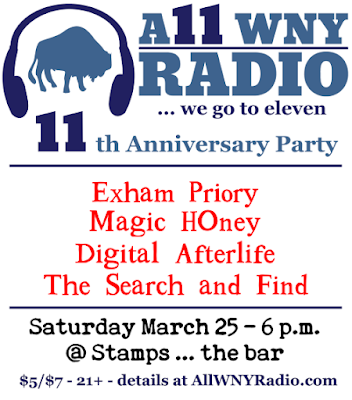 TONAWANDA -- Joining Exham Priory onstage at All WNY Radio's 11th Anniversary Party will be The Search And Find, Magic Honey, and Digital Afterlife. The 11th Anniversary Party will be hosted by All WNY Radio talk show host and event coordinator "ThinkSoJoe" Kent beginning at 6 p.m. on March 25 at Stamps with music set to begin at 7 p.m.
Exham Priory, consists of Nick Lucido, Luke McCarty, Dan Twist, Anthony Vigue. The Niagara Falls-based rock veterans came together in late 2015, bringing their varied influences to create a sound harkening back to some of the golden ages in music. The Search and Find is a five-piece alt-rock outfit from Buffalo composed of Allie Burns, Blair Ganoe, Jake Morgan, Chris Oliveras and Eric DeJesus. With influences ranging from Eric Clapton to Alice in Chains, Magic Honey crosses genre boundaries, although they refer to themselves as "alternative soul rock." The Buffalo-based band consists of Sebastian Martin, Vo-ece Haygood, Eric Manke, Thomas Walsh and Glenn Papp. Last but not least, Digital Afterlife, is an alt-electronic duo from Buffalo comprised of brothers Paul and Greg Burt. Greg also serves as event promoter for For the Music Productions and writes the weekly column "HEaRD in WNY" for All WNY News & Radio. The party is 21+ with a $7 cover at the door or $5 in advance through Kent, Greg Burt, All WNY Radio Program Director Scott Leffler or online through All WNY Deals.